Now that Johnny Depp and Tim Burton have had their hand at Roald Dahl’s book Charlie and the Chocolate Factory, everyone wants to be the man in charge of the mystical candy factory. The Condescending Wonka meme has probably helped, too Willy Wonka has long been a mysterious character but now anyone can capture his look and be the legendary candy man for Halloween. But you’ll have to think outside the box! Ready-made Wonka costumes are no longer available. (Crazy, isn’t it?) eBay, however, is a different story. It’s like a chocolate factory that just keeps giving! There are custom replica costumes available, as well as replica props. Isn’t that delightful!? Remember the original look of Willy Wonka as played by Gene Wilder in 1971? White pants, a bright violet frock coat, large bow tie, and tan top hat. Gene’s hair was a little wily, and no one makes a replica wig of it, so you’ll have to get creative there. Backcomb it to the moon! Tim Burton’s Charlie and the Chocolate Factory brought forth a new Willy Wonka that is just as mysterious and magical as the original, but now he has a Tim Burton/Johnny Depp feel to him. 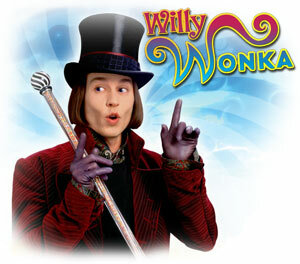 Even though Wonka still sports a top hat, long coat and cane, it is all a little darker in color with a cartoon feel. The easiest way to get the look of the new Willy Wonka is to purchase it online. Warner Bros. offers officially licensed Willy Wonka costumes which have decent attention to detail. To fully complete the costume everyone is wondering where they can get some purple Willy Wonka gloves. Latex looking purple gloves to be more precise. eBay almost always has the best options. Search eBay for Purple Latex Gloves. Remember Wonka’s crazy glasses to complete the costume! It seems that most people choose the TV Room Goggles because of the look, but the added bonus of 100% UV protection and impact resistance is also a good reason to get them. The Willy Wonka cane that is used in the 2005 movie is a little hard to come by. But we have been seeing some ebay auctions for hand made replicas! Search eBay for Willy Wonka Costumes. Nothing helps a Willy Wonka costume make a grand entrance into a room without a cocoa bean loving Oompa Loompa or two near by. It would make a great family costume idea to have an adult as Wonka the legendary candy man and a couple kids as Oompa Loompas.